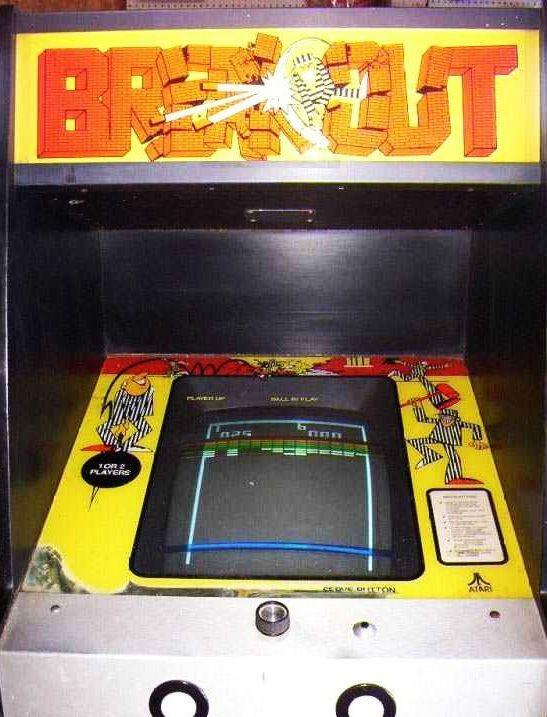 Breakout by Atari, introduced on May 13, 1976. Time Warp..Taking a look at the classic! The Birth Of A New Game..
Breakout, a discrete logic game, was conceptualized by Nolan Bushnell and Steve Bristow, after the latter had [rejoined] Atari after the merge of Atari subsidiary Kee Games. Bushnell and Bristow had an idea to turn Pong into a single player game, where the player would use a ball to deplete a wall of bricks without missing the ball on its rebound. Bushnell was certain the game would be popular, and the two partnered to produce a concept. Al Alcorn was assigned as the project manager, and began development with Cyan Engineering in 1975. The same year, Alcorn assigned Steve Jobs to design a prototype. Jobs was offered $750.00 with an extra $100 each time a chip was eliminated from the prospected design. Jobs promised to complete a prototype within four days. Atari was unable to use Steve Wozniak's design. By designing the board with as few chips as possible, he also cut down the amount of TTL [transistor-transistor logic] chips to 42. This made the design difficult to manufacture, it was too compact and complicated to be feasible with Atari's manufacturing methods. However..Wozniak claims Atari could not understand the design and speculates maybe some engineer there was trying to make some kind of modification to it. Atari ended up designing their own version for production, which contained about 100 TTL chips. Wozniak found the game play to be the same as his original creation and could not find any differences. Breakout begins with eight rows of bricks, with each two rows a different color. The color order from the bottom up is yellow, green, orange and red. Using a single ball, the player must knock down as many bricks as possible by using the walls and/or the paddle below to ricochet the ball against the bricks and eliminate them. If the player's paddle misses the ball's rebound, he or she loses a turn. The player has three turns to try to clear two screens of bricks. Yellow bricks earn one point each, green bricks earn three points, orange bricks earn five points and the top-level red bricks score seven points each. To add to the challenge, the paddle shrinks to one-half its size after the ball has broken through the red row and hit the upper wall. In addition, ball speed increases at specific intervals: after four hits, after twelve hits, and after making contact with the orange and red rows. The maximum score that one player can achieve is 896, by eliminating two screens of bricks of 448 points each. Once the second screen of bricks is destroyed, the ball in play harmlessly bounces off empty walls until the player finally relinquishes the game, as no additional screens are provided. However, a secret way to score beyond the 896 maximum is to play the game in two-player mode. If Player One completes the first screen on his or her third and last ball, then immediately and deliberately allows the ball to "drain," Player One's second screen is transferred to Player Two as a third screen, allowing Player Two to score a maximum of 1344 points if he or she is adept enough to keep the third ball in play that long. Once the third screen is eliminated, the game is over. 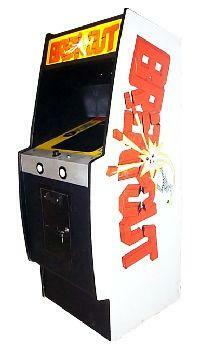 Breakout was influenced by the 1972 arcade game Pong, also by Atari.